As tax day arrives, it’s worth considering how the federal government spends your tax dollars. 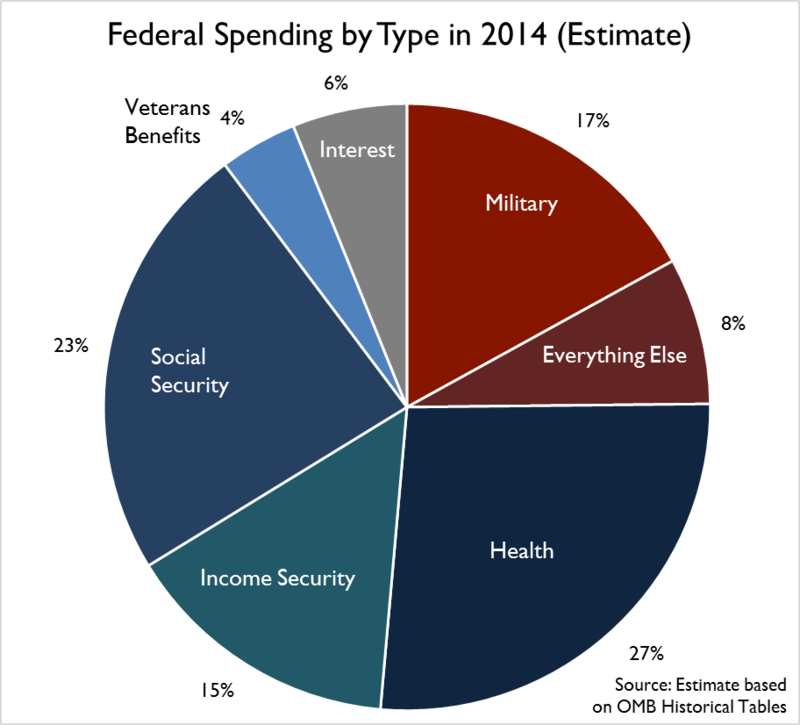 The chart below presents the breakdown of federal spending in 2014 as estimated by the White House’s Office of Management and Budget (OMB). In 2014, the largest budget item is spending on health, which takes up 27 percent of the $3.65 trillion in projected outlays. The next largest item is Social Security at 23 percent of the spending. Defense spending comes in at 17 percent of spending, closely followed by income security at 15 percent, which includes programs such as unemployment insurance, food stamps, housing assistance, and disability insurance. 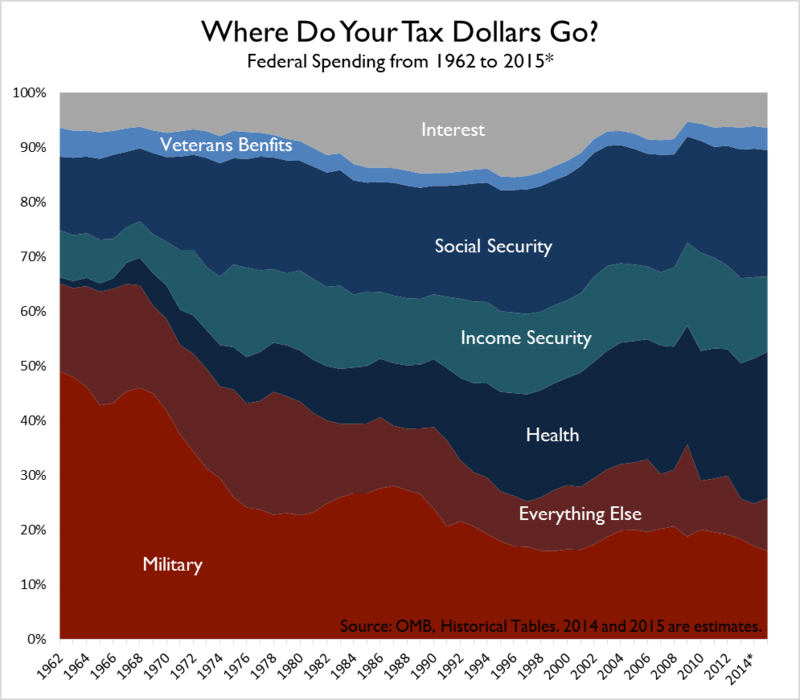 The “Everything Else” category – 8 percent of federal spending – includes transportation, commerce, agriculture, international affairs, education, etc. Veterans benefits and interest payments make up the final ten percent of outlays. When combined, Social Security, income security, and health programs make up 65 percent of federal spending in 2014. In order to add context to this discussion, it’s beneficial to see how these numbers have changed over time. If we look at 1962 (the first year for this data set), federal spending looked significantly different. 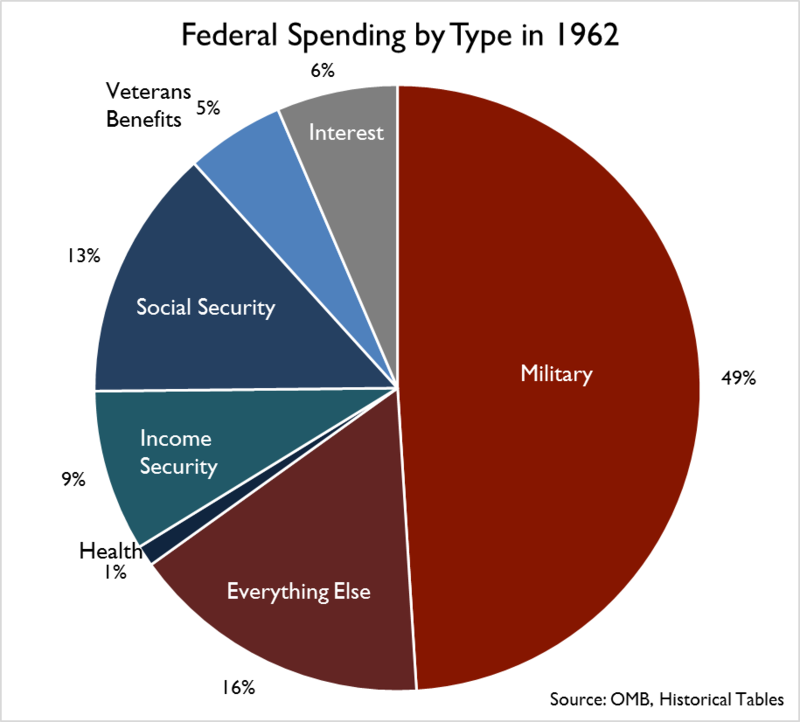 In 1962, military spending accounted for 49 percent of spending, a 32 percentage point difference from 2014. Health is another other big mover. In 1962, spending on health related programs covered 1 percent of spending. The drastic change is largely due to the creation of Medicare and Medicaid in 1965. Income security programs and Social Security consisted of 9 and 13 percent of the spending, respectively. Veterans benefits and Interest took up a similar percentage of the budget at 11 percent combined. In the chart below, you can see how the composition of the budget changed in the 50 plus years between 1962 and 2014. See here for our report on where the tax dollars come from.